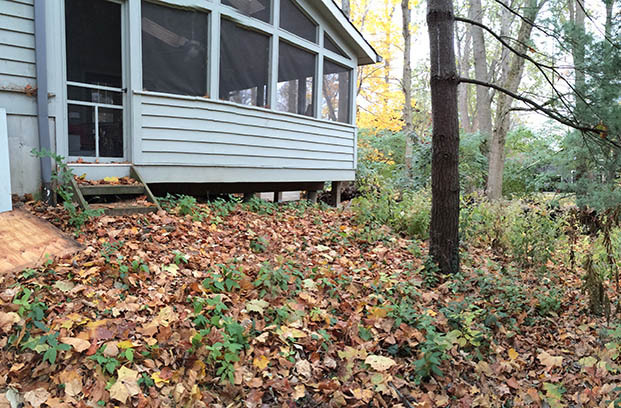 In this backyard in Anderson Township, honeysuckle and english ivy grew thick. The space was unused. With a three-year-old and a newborn on the way, the family wanted a space for playing and relaxing – a place to explore within eyesight of Mom and Dad. Today on a summer evening, you can find the whole family outside. Children manipulate the water from the rain barrell to make their dry creek begin to flow. They splash in the water and make fishing rods and other props from plantings strategically chosen to engage the senses like ostrich ferns, Japanese forest grasses, spicebushes, and highbush blueberries. The space feels both open and private – a mini suburban woodland. And though Mom and Dad may not be climbing, sliding, balancing, jumping, and splashing, they seem just as content to lounge on the deck under a low canopy watching play unfold. Utilizing the three season room the deck allows for parental viewing of the entire playscape. Phase II will incorporate an outdoor chalkboard under the windows. The rock steps were found on site and utilized. One of the key features of this playscape is the creek. It is dry when not in use - cutting down on the mosquito population in the backyard. But is connected to rain run off from the roof for water play. Because of this feature, the family is not using any of their city water to play - cutting down on cost and conserving water.